Today a number of us are dedicating our blogs. My dedication is to my Mom, Margaret Ann Mahar McCreary. 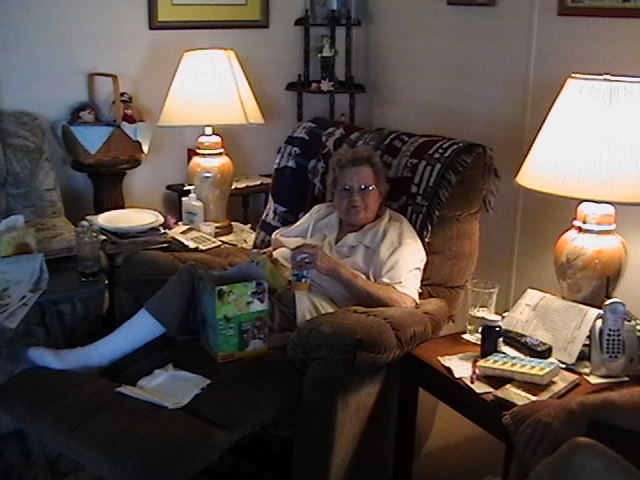 Mom passed away a few years ago and I miss her like crazy every day. She was funny, smart, and a terrific mom. She could NOT sing, but she did it anyway because she loved to sing. She loved children and they swarmed to her like bees to honey. She was always willing to try new things so I was the one who taught her to knit! She liked to knit baby things and, in her later years, dish cloths. She was the one who really encouraged me to keep on knitting and was proud of everything that I knit for her and for others. I talked about the sweater that I knitted earlier this year and how Mom loved it and wore it often. For her last five years, she lived in Florida and I didn’t see much of her, but she loved living there (but missed being near her grandkids) because she could swim every day. I see a lot of Mom in me and it makes me proud. So thank you, Mom, for all that you did! I love you and will see you in Heaven! Evening Family Bible Time – Let’s Look at the Stars! Summertime is the perfect time to have an evening family Bible time. Since the kids are out of school, you can wait until full darkness, when the stars are out, and head outside with a blanket, a flashlight, your Bible, and some mosquito spray. Knowing the constellations would be helpful but not necessary. The brightest star in the sky (at night) is the North Star (Polaris), which points the way to the Big Dipper. Before heading outside, spray the kids with the mosquito spray, and take time to highlight or otherwise mark the following Bible verses: Genesis 1:16, Isaiah 40:26, Psalms 136:7-9, Amos 5:8, Job 22:12. If you have older children, they can help read the Bible verses. Taking the blanket, head outside to a place where everyone can clearly see the stars. Ask your children if they can count the stars. Encourage them to count as many stars as they can. Read Genesis 1:16 then Isaiah 40:26. Tell the children that God made so many stars that man cannot count them. In fact, scientists have figured out that there are so many stars in the sky that they can only estimate – and the number they estimate is 1021 or 10 with 21 zeros behind it! Read Psalms 136:7-9. God made the stars even before He made man and woman. God knew that we would need the stars in the heavens to help us navigate and to help us determine our calendar. In days past, people thought the stars were grouped together to form pictures and gave these pictures names. Some of these were names of things like the Big Dipper and the Little Dipper. Others were names of heroes like Orion and Hercules. Locate the Big Dipper and read Amos 5:8. The “seven stars” referred to in Amos are the stars of the Big Dipper. If you know the names of the other constellations, point them out to the children. Open your Bible and read Job 22:12. Tell your children that if God can create something so large and so awesome, He is THE one who can be counted on to help them…anytime and anyplace. Invite your children to pray, thanking God for the stars and for taking care of them. End with a prayer thanking God for your family and for the many ways that He takes care of them. . Sing the song “My God is So Big” or another song that celebrates God’s greatness.